I am a consumer of information like you wouldn’t believe. I devour news and learning at the same frantic pace that I like to be outdoors and enjoy nature. Apparently, it’s all or nothing with me and the way I like to experience things. That’s why I am starting my Week in Review with Cafecito series. This is where I grab yet another cup of my favorite beverage, coffee any style, and I run through a quick review of all the news and new information I have consumed. Marco Gutierrez, a Donald Trump supporter and founder of Latinos for Trump, made the mistake on a September 1st MSNBC appearance of foretelling the gloom and doom of illegal Mexican immigrants taking over. He decided to use the threat of having “taco trucks on every corner” as the big negative of this situation, because according to him, Mexicans are a very “dominant culture”. Of course, this was an opportunity like no other and the #tacotrucksoneverycorner memes popped up everywhere. I must confess that I have shared quite a few, because it’s downright ridiculous and hilarious at the same time. I listened to the latest podcast from Latino Rebels on my jog yesterday, and they had Mr Gutierrez on the show. There were some interesting points made and he was given the opportunity to react to the memes and all of the press he has gotten, which includes personal and finance details. It was quite an informative show. Check out the Latino Rebels podcast here. We’ve been working on a soft launch of the website and I am happy to see a good amount of new sign-ups without any paid advertising at this point. I’m also very excited about the site being at the top of Google search results for our target keywords. We will continue running the soft launch for the next couple of months as we develop the podcast and feature articles sections. This project is truly a labour of love (gotta love the cliche), and something I really enjoy working on. Today show co-host, Matt Lauer has been slammed for lobbing soft questions at presidential candidate Donald Trump and harping on the email scandal with Hillary Clinton. Many in the media complained about Lauer’s complete failure to ask questions about Trump’s controversial remarks about Gold Star parents Khizr and Ghazala Khan, his dissing of Sen. John McCain as a POW, or his Vietnam War deferments. I’m excited to finally see Trump and Clinton have an actual debate. I hope the moderators are fair and ask each very pointed questions about their plans and policies on the ISSUES. Today was open house at my youngest son’s new Classical Academy where they take a Socratic approach to teaching. He is in eight grade and we are both very excited about this year’s schooling. While we do homes-school him, his days are very structured. He also has baseball, which the husband is now coaching. We spent the last 3 years traveling around the country and not really staying in one place longer than a handful of months, but the kiddo wanted to pause for a while and go to an actual school and play baseball, so we’ve done just that. After doing the whole PTA, coaching, being-involved-in-everything for so many years, it was nice to unplug from that for a few years. Now it’s time to plug back in. We will still travel quite a bit, but it will be planned around the school & sports schedules. For example, we will spend three weeks in Kentucky for a Halloween Rally and one month in Orlando in January with several of our snowbird friends, so that’s exciting. I finally decided to put my snapchat to use. I was putting it off because I like to see the business case for social platforms before I start to test things out. Snapchat’s target market is a lot younger than what I generally work with for my clients, so I just thought I would deal with it later. This week I decided to just have fun with it and start to brainstorm on ways to use it for business for current clients. I had a lot of fun and silliness ensued. I did come up with some neat ideas, but I’m going to have to flesh it all out a bit before I start to test. I will say that since Instagram unveiled their stories, I started to cross post my snaps there, and frankly, I prefer Instagram, since there are actual stats for me to work with as a marketer. Snapchat, you need to give me some numbers to work with here! 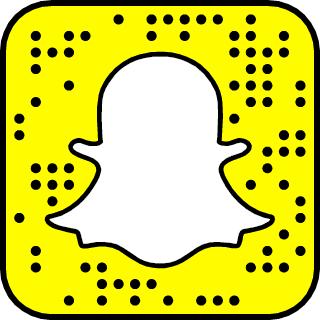 If you’re not on, sign up at www.snapchat.com and if you’d like to follow my silliness, you can scan my snapcode below and add me there. See you on the snap side! Looks like some cool stuff you’re working on!